For the first time, the ride forms the informal start of the Bike Bath weekend. We are really grateful to Bike Bath for supporting the event and thanks to them there is no charge to take part - the ride is free.. but the beer and food at the end comes at a cost! We hope everyone will join us after the ride for a chat and the ‘prize giving’ - please bring a fiver (£5 per head) to put in the beer/drink/food kitty - the Wheatsheaf is a fantastic country pub, and they have kindly offered to host us and provide the food (hotdogs and chips). There are some fantastic technical trails and narrow country lanes in the area and this year one 20km long route takes in all the best bits with short cut options if you puncture or run short of time. Part of the route takes in the rocky descent through Taits Wood below Hinton Charterhouse. We are incredibly grateful to the landowner who has given us their permission to use this private track. If you know anyone who can’t ride but would like to help out, we’re looking for someone to help man signing on and welcome riders back to the start and finish. Food and drink will be provided. 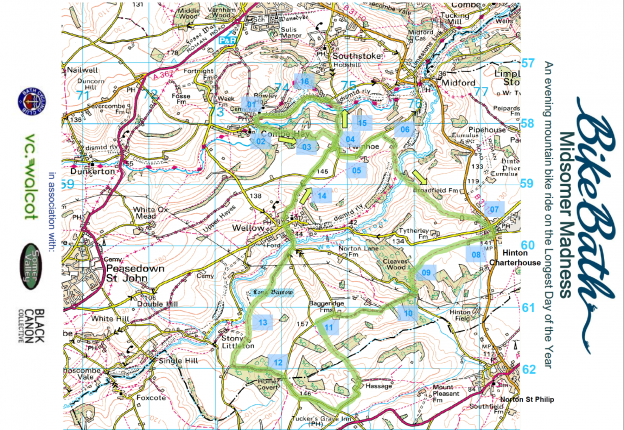 Where?......Meet location and start and finish: The Wheatsheaf Pub, in Combe Hay, BA2 7EG. When?......Signing on opens at 6pm. We intend to send riders off in up to 4 guided groups of about 8 to 12 from 6.30pm. The last group will leave at 7.00pm. Ride finish between 8 and 9pm followed by prizes and drinks (bring a warm, post ride top as we are outside, if weather is dry). What?.......All the best bits in one fun packed 20km route with short cut options for if you are running behind. How much?.. Nothing! But there’s a fantastic country pub at the end! Please bring £5 for the food and drink kitty. All riders ride at their own risk. The ride includes technical trails linked together by country lanes. Great views and a challenge. You’ll need off road experience and a properly maintained mountain bike. Please wear a helmet. They do save lives. Just ask Andy! PRIZES! Yes, thanks again to Bike Bath we’ll be awarding a range of ‘spot’ prizes for the ‘most spirited ride’ to one rider under 25 and one woman and one man. Hope to see you there, happy riding!